Follow the epic journey of a baby from ancient Egypt, cast out for the color of his pale blue skin, as he rises through the ages to become humanity’s greatest enemy! Rescued and raised to believe in the survival of the fittest, the child of destiny known as En Sabah Nur is targeted by the pharaoh’s scheming vizier Ozymandias – and the time-traveling Rama-Tut! 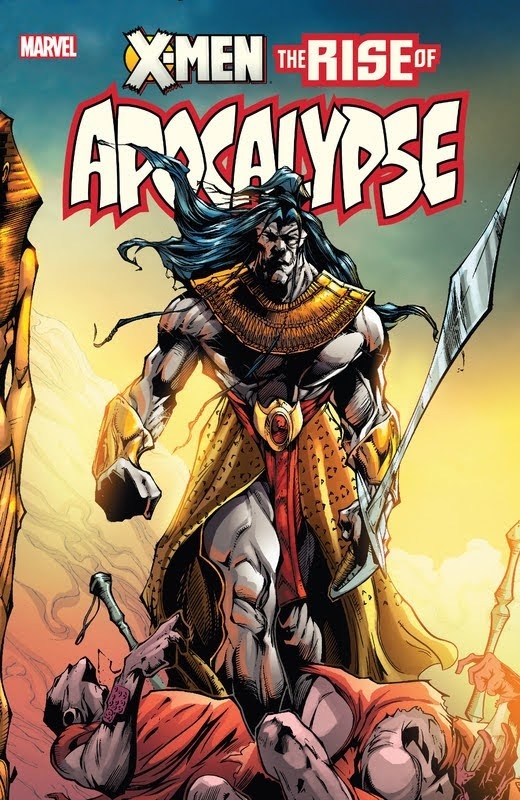 Millennia later, join timetorn Cyclops and Phoenix in the 19th century, caught between Apocalypse and Mister Sinister! Then discover the centuries-old rivalry between two dark lords: En Sabah Nur and Dracula himself! And in the Middle Ages, Apocalypse pits Exodus against the Black Knight! It’s the hidden history of Apocalypse in one time-twisting tome!